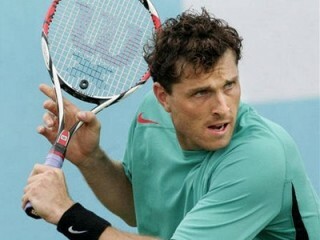 Michael Berrer, a native from Stuttgat, Germany is a professional tennis pro, who plays in the ATP World Tour. He reached his career high in singles with No. 42 on May 2010 and his high in doubles in March 2009 with No. 134. He plays left handed with one handed backhand shot. He was turned professional in 1999, and till March 2009, he has won Five Challenger Series tournaments. In November 2007, he attained his best career ranking World No. 51 by ATP, but later due to lack of consistency, his ranking was dropped and at the moment he is in ATP Top 200. At the start of 2011 he again reached the Zagreb final where he was defeated by Ivan Dodig in straight sets. He won his first Grand Slam match at the 2011 French Open against 26th seed Milos Raonic, before beating Arnaud Clement in the second round. In the third round, he was defeated 6–2 6–3 6–2 by Britain's Andy Murray. On February 1st, 2012, Berrer ousted top-seeded Croatian Ivan Ljubicic in straight sets at the PBZ Zagreb Indoors tennis tournament. Berrer lost just 15 points over 10 service games in a 6-4, 6-4 win over Ljubicic. Berrer took nearly two-thirds of the points off Ljubicic's second serve and had three breaks. Two of the breaks came in Ljubicic's last two games serving. Berrer advances to the quarterfinals against Jurgen Melzer, who knocked off No. 5-seeded Andreas Seppi 6-2, 6-3. Melzer won almost as many points (24-26) as Seppi when Seppi was serving. View the full website biography of Michael Berrer.